This website is a work-in-progress by Laurent Dubois, David Garner, and Mary Caton Lingold. Our goal is to showcase our research on the history of the banjo in the Afro-Atlantic world, including historical documents, visual materials, material objects, and musical transcription and analysis. We focus particularly on Haiti and Louisiana, but also provide information from other areas along with the transcriptions of a wide range of banjo music. We are also the creators of Musical Passage: A Voyage to 1688 Jamaica, a digital project that explores rare musical notation documenting African performances in the Americas. 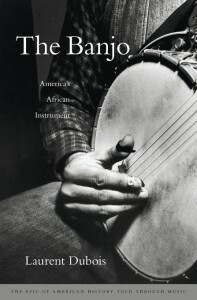 You can find a full history of the banjo, including fuller analysis and contextualization of the materials on this site, in Laurent Dubois, The Banjo: America’s African Instrument (Harvard University Press, 2015). Writing the history of the banjo, especially of its early formation as an instrument, poses important challenges. We have to return to the period of the 17th through the early 19th century, and to work from fragments to reconstruct what we can about the construction, sound, and social and cultural meaning of the instrument. In recent years there has been a proliferation of excellent research on the early history of the banjo. For a detailed investigation of some of the West African instruments that inspired the construction of the New World banjo, and an interpretations of the early history of the banjo, you can visit Shlomo Pescoe’s three excellent Facebook pages: Banjo Roots, Banjo Roots: West Africa, and Banjo Roots: World Banjo. For an exploration of some of the broader methodological and theoretical questions behind this particular site, you can read this paper by Laurent Dubois titled “Afro-Atlantic Music as Archive.” It explores how thinkers including W.E.B. DuBois and Paul Gilroy have thought about the history of music. The second half of the paper uses the example of the banjo to suggest ways in which a combination of textual, material, and visual analysis can allow us to piece together fragments into a larger history of music. 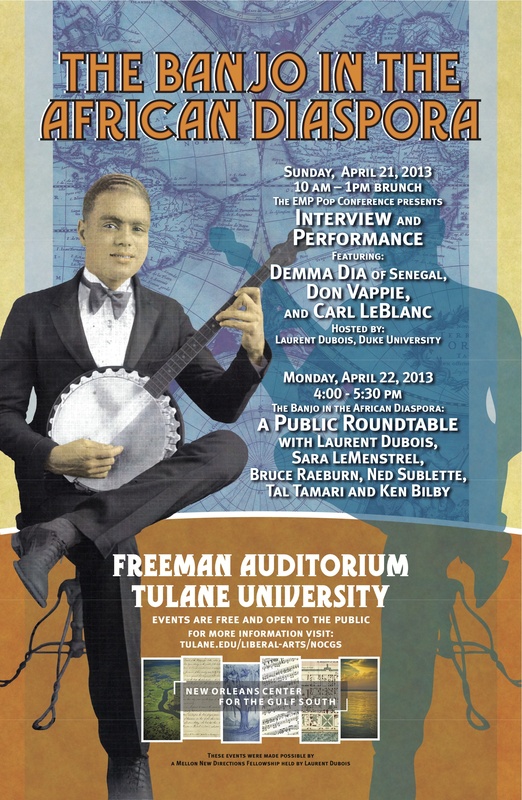 The website was originally created as the basis for events taking place at Tulane University on April 21-22, 2013 around the theme of “The Banjo and the African Diaspora.” These included a Brunch concert/discussion at the EMP Conference on Sunday, April 21st, from 10-1 p.m. featuring music by New Orleans banjoists Carl LeBlanc and Don Vappie, and the Senegalese group Njum Waalo and a roundtable discussion featuring Kenneth Bibly, Bruce Raeburn, Ned Sublette and Tal Tamari, and moderated by Laurent Dubois and Sara Le Menestrel from 4-6 p.m. on Monday April 22nd in the Freeman Auditorium at Tulane University. 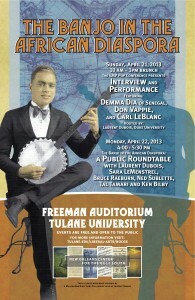 You can find a detailed account of a lecture by Laurent Dubois about the banjo, delivered at the University of Memphis in September 2013, here. Our goal is ultimately to allow visitors to explore and comment on sources relating to the banjo’s fascinating history. We welcome your comments and suggestions! Header Image: Pete Seeger’s Banjo. I am with the Deering Banjo Company. Please contact me and let me know if we can help you with any of your research. Thank you, David! How might we be in touch with you — via email, perhaps? Would be very interested in talking about the history of the company, technologies for banjo-making, etc. I love banjos. Have you heard this banjo solo of 9 year old: https://www.youtube.com/watch?v=GXcRI0BdioE ? Thank you for providing this important banjo information. I look forward to our postings. Great site! Hope to contribute something sometime. Thank you, Valerie and Fred, for your kind comments. We are always looking for new material and information about this history so feel free to share ideas in the comments section here or on specific pages! Dear Joshua: Thanks for your comment! It’s very exciting to hear about your work making gourd banjos. We would love to get a chance to come visit and see and learn more about your work at some point, and — if you are willing — perhaps showcase some images of the banjos you have built here on the site? Thanks for being in touch! I attended your lecture at University of Memphis last night. I just wanted you to know that I really enjoyed it and learned a lot about the banjo. I have always enjoyed banjo music, but knew nothing of the history. Such a great work here! I will be happy to meet you in France maybe, next june 14-15. Greetings from Tony Hall in England, U.K.! I have by chance linked to Banjology and thoroughly enjoyed exploring the site. Although I’m a layman when it comes to playing, making or the history it didn’t stop me falling in love with the banjo through a quite extraordinary Tenor Banjo my late Dad created 75 years ago. I would be very happy to contribute, but I’m not sure if this fit with your goals. Recently I uploaded on Flickr detailed photos and history and wondered if you would kindly view this information and let me know if you think it is worthy of consideration for Banjology. All the best from across the Atlantic! Dear Tony: Thanks so much for your comment. We’re always interested in sharing additional information, of course, so do comment with the links to your Flickr page and other materials: it can help if you can place them in the comments sections of relevant sections of the website (for instance if this has to do with the jazz banjo) so we have a sense of where we might incorporate it. Thanks! Thank you for great useful informations and articles. Keep it up. I have finished building three-string rivercane ekontings of the Gambia region of west Africa. They can be be on my website http://www.grantcustombanjos.com. Videos with sound to come soon! I have also been talking to musical performers from Haiti who said the gourd banjos I make resemble the ones he had seen growing up there! I want to go and find gourd banjo makers in Haiti, wouldn’t that be awesome!! Please correct my last comment to:” They can be found on my website…” typo, sorry! Please feel free to use any photos on my site as well. Like the website. I’m a grad student in Austin and I am trying, with some difficulty, to nail down when the banjo arrived in Texas. Although this endeavor my be quite theoretical, I hope to find some source material in the local archives that mention music and the banjo in early Texas. Any insight on the nature of the instrument arriving to Texas would be wonderful. Wonderful site and exciting research on this most American instrument. An anecdote that might be of interest, speaking of Texas: my father’s uncles, who emigrated as poor farmers from Burgundy, France to the Fort Worth area around 1901, were remembered by my dad as playing banjos on their porches by the 1940s. Perhaps that was their way of emphatically becoming part of American culture. In any case, a mind-boggling process of assimilation! Has anyone reached out to Bela Fleck? As I am sure you know, he plays a jazz banjo and has traveled the world incorporating native musicians playing native instruments into his band and performances. Just a thought. Just seconding George’s comment on Bela Fleck. Seeing the copy for the forthcoming book, I immediately thought of Fleck’s documentary Throw Down Your Heart, where he travels to Africa in search of the banjo’s origins. Chuck Davis and the African American Dance Ensemble provided the history to the banjo and Africa back in 2012 in which Mr. Davis choreographed a piece with the Chocolate drop ban, cloggers and another band to show how the banjo had been apart of African History since its inception. Dom was with the chocolate drop when this work was created. Surprised he did not mention Mr. Davis bringing him along with others on board with the history of the banjo and its relation to Africa. Am reading your book and discovering your website today for first time. Lefty banjo took me a while to find and have been at it for five years or so–my banjo arrived on MLK day–not a coincidence, I think! Thanks for this–best thing since Steve Martin. Thank you, Don — Really appreciate the compliment! Glad you are enjoying the book. Copyright © 2019 Banjology. All Rights Reserved. Banjology is powered by WordPress at Duke WordPress Sites. Please read the Duke Wordpress Policies. Contact the Duke WordPress team.